I am an avid health conscious person who can’t give up my latte to the point where I’ll walk past the first three branches of Starbucks to kid myself I’ve earned it. One lazy afternoon, while pondering over the romantic journey of coffee beans, I let my mind slip and asked the forbidden question, “what goes in to my latte?”. And hence the intensive research began. Before you read any further, I should reveal that I have no credentials to speak of. The research was done solely on the Internet and by observing the baristas at my local coffeehouses. In this section, I am referring to chained coffeehouses that use a structured menu. Not all commercial coffeehouses will fit in this category but most do. The one I focused my research on is, of course, my beloved Starbucks. Wherever I travel to, I can always find comfort in one of its many establishments. Coffee-based latte is made up from 2 essential parts; 2/3 or more of steamed milk and up to about 1/3 espresso. For tea-based latte, strongly-brewed tea, tea concentrate or tea powder mix is used in place of the espresso, and the proportion of milk reduced. Then, comes the not so essential flavored syrup, in various amounts depending on the complexity of the recipe. Next is whipped cream and optional sprinkles and drizzles. All of that make up my ESSENTIAL morning wakeup call. At this time of year, it would have to be a peppermint mocha latte (love). Switch to a less complicated latte. Not always true, but I think a shorter named latte has lower sugar. Calorie contents in peppermint mocha latte and vanilla latte with and without whipped cream topping, all at 16 oz. So here is another one of my favourites; a vanilla latte for a healthier day. Let’s line them up for comparison. First column, a full-option peppermint mocha latte will provide me with 436 kCal, a meal’s worth of energy. By removing the whipped cream, I can save 70 kCal. If I change my order to a full-option vanilla latte though, the calorie per drink drops to 320 kCal. Most of the reduction is down to the mocha syrup. If I am willing to knock off the whipped cream, that is another 70 kCal. In the final column, I switch the milk to non-fat milk and drop the calorie down another 50 kCal, leaving me with a very acceptable latte at just under 200 kCal damage. Hoorah. All the comparisons in the graph above are for 16 oz drinks. I keep the 8 oz (99 kCal) for when I’m on a strict diet. As a firm believer of the Middle Path, I believe I can live in harmony with my lattes. Surely it must be all about balance and control. One mustn’t be overdoing it. So while researching, checking and cross-checking my info, I created a super excel worksheet to help me make an informed choice more easily. 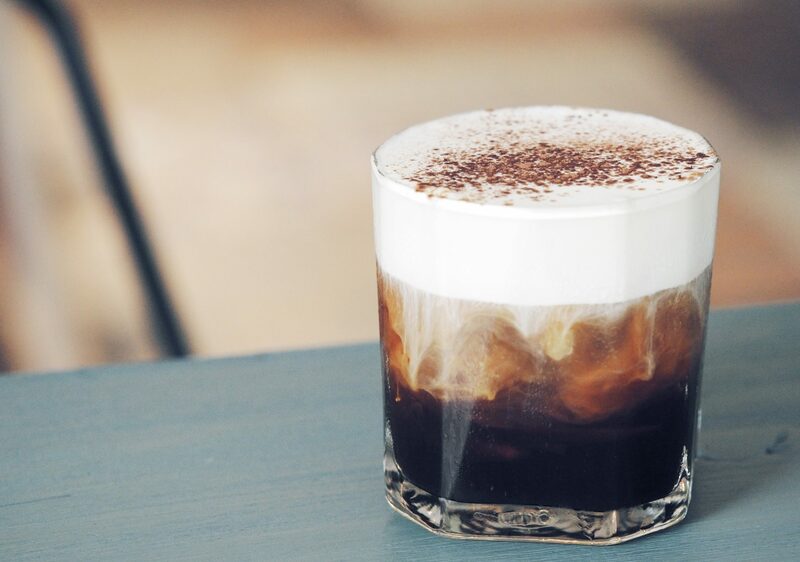 Even though the calorie information is not absolutely true to each individual latte due to variation in recipes, the local ingredients and the barista’s generosity, it serves as a very good guideline. Then I paid my boyfriend with a promise of a year’s worth of Starbucks’ white hot chocolate to make me a user friendly App to track and balance my latte habit. The App is free to download. With the free version, you can check the calories of the drink you are about to order. And as an anti-incentive, it tells you how many minutes of exercise you have to do to balance your latte. You can also send a sticker to your friends as a testimony of the exercise you will hopefully do later.